It's the end of another week! That means it's time for the FRIDAY HOPS! 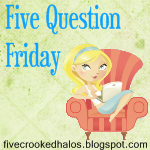 If you are here for FIVE QUESTION FRIDAY or FRIDAY FRIEND CONNECT, or FOLLOW FRIDAY 40 AND OVER then just scroll down! HUGE thank yous and hugs to the gals who sponsor these Friday memes! 1. Most things always tastes better with BUTTER. Of course, that's one more thing that is out of my daily diet nowadays. And it is partly to blame for my girth. But it sure is good! 2. I predominately read STEPHEN KING! I have been reading him since college and I have never really stopped! Other than that, you'll find me with an old classic in my hands. Every once in a while I'll read something new- I do enjoy Jen Lancaster's books and, of course, CAROL'S newly published MINI SKIRTS AND LAUGHTER LINES! Oh, did you mean WHERE? Wherever and whenever the mood hits me! 3. I have brand loyalty to NOTHING and NOTHING. I can't think of one single brand of anything that has ever been good enough or honest in their marketing approach enough to commit me to loyalty. 4. When I feel sad, I like to do whatever it takes to come out of it. I hate being sad. I would rather be angry than sad. There are times when cleaning something or writing in my journal helps BUT the thing that is quite instrumental (no pun intended) in bringing me out of it is MUSIC! 1. Do you apologize to your kids if you're wrong? YES! Always have, always will. 2. Do you have a class ring, letterman's jacket, or similar obscenely priced high school "must have"? Yes. Well, I did. I couldn't tell you where in the world anything like that is anymore. But I know where our daughters' high school treasures are! 3. If you could be one age for the rest of your life, what age would you choose? Probably late 30s early 40s. Those were the most fantastic years---so far! 4. What is your favorite (unused) baby name? I really did think about this one for a while and I guess I just don't have one. Although, DoodleBug did nanny for two kids this summer and the little girl's name was Petula. I really like that! 5. If you could make your child like something what would it be? I can't even fake an answer to this one. I hate it when people try to make me do or like anything so I NEVER do that to anyone. That, to me, would be like an invasion of their personal identity. I love all of your answers...and I also hate being sad! I think I agree with you the most on that one....I will do anything I can to get out of it! Absolutely brilliant answers, Pam! 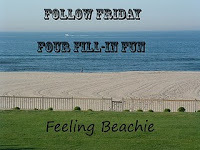 I always enjoy reading what you have to share, even though these Friday posts of yours come about all too quickly! Yes, I know. ALL young folk celebrate Fridays, but for me, my weeks seem to be slipping past at an ever frightening rate! Brenda- It seems such a waste of time when there's so much to be happy about, eh? Desiree- Thank you! I know, they do come quite fast indeed. I try so hard to slow it all down...to no avail. But I do try! Every time I read your answers I´m amazed at how much we are alike. I hate being sad too. I love your answer to #5. I hate when parents try to turn their children into someone they're not. Yes! to the idea of ever trying to change anybody. My independence is so great that I just assume everyone has/wants it. For a long time I wondered if I was a 'bad' mom because I couldn't bring myself to mold them to any shape but their own. My only daughter is very glad that I didn't use the names I really, really liked: Ursula and Dagmar. I still like them. Love your answers today! ALL of them. Kara- Me too. Kids have to grow into who they are going to be, not who their parents want them to be. Seriously, shouldn't we want them to be themselves? I did! Stephanie- Well, I'd say that those are quite some...unique names. I might also say that I'm with your daughter. LOL The lovelies were allowed to grow into their own identities. And they are grateful for that! They are all four completely different- and I love that! MKM-Thank you so much! You're so sweet! I had to have the very best senior ring my folks could afford. Then I went on vacation 2 months later and lost it. Of course I wouldn't have been caught dead in it once I went to college anyway. One of these days I've got to learn how to hook up for the hops. Michele- I can't even find anything from high school OR college. None of it ever means anything after the fact I guess. The HOPS are easy! Let me know when you want to do it and I'll help you! Yep, I agree the late 30's early 40's are doing good - my daughters almost 20, so its nice seeing what an independent person she's become. Biz-I really enjoyed mine, that's for sure. They just went by way too fast. The lovelies are 20, 23, 24, and 26- and we couldn't be more proud of them if we tried! It is funny how I found myself shaking my head in agreement with your answers! I am loving my forties!! Paula dean sprung to my mind with your number one! Hilary- I know girl! She does love her butter, doesn't she?! 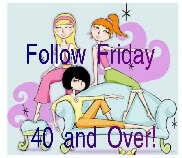 New follower from the over 40 blog hop. So nice to meet you. Both my kids are older, 17 and 22. They are both planning on moving out next year. My son is doing his last year of his master locally then has to do his phd away. My daughter is planning to join the army. So a year from now I'll be in the same boat as you. I'm freaked right out. Lol! I cannot read Stephen King books, something about his writing style. However, the movies that are made from his books I think are great. Kim-Exciting- a new follower! I love followers! I'm heading over to your blog now! Well what kind of music pulls you up of the sad times? That's what I love about you! Your honesty! Nothing compares to honesty.